All in with a flush draw, Rayo Kniep is at risk for his #TVWSOPCircuit tournament life as Devin Jackson has a pair of Sevens. The turn is a blank. The river repeats the turn and Kniep is eliminated in second place, cashing for $48,503. Jackson collects his second WSOP Circuit Ring - his first in HORSE a few years ago in Lake Tahoe. $78,199 goes to the champ. 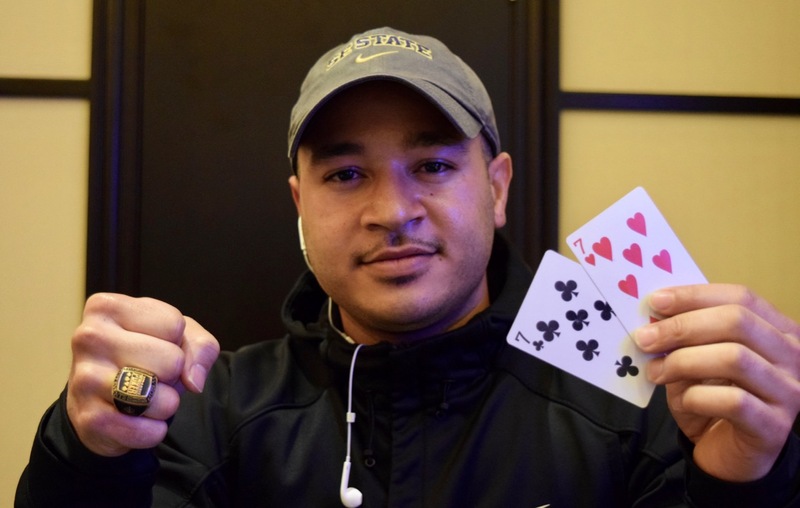 An all-time TVPokerRoom single-flight record 629 entries came through the doors on Saturday for the fifth and final flight of the kickoff event for the January 2018 WSOP Circuit Thunder Valley Series. The 1,511 entries topped last September's first-ever WSOP Circuit event at Thunder Valley that drew 1,406 entries and had 561 for the final flight. Both of those numbers from last September were the previous records for TVPokerRoom for that size of buy-in. Jackson, Kniep and the entire final table players battled for more than 3 hours after cutting the field from 222 who came back Sunday, down to the last 10. Two women - Hiaxia Zhang and Lorena Chiquillo - made the final table. Chiquillo, a local player, finished 8th and Zhang, 2014 WSOP Ladies Event bracelet winner - finished 4th. When Hafiz Kahn was eliminated in 3rd place, the heads-up match was set, the players each holing more than 7,000,000 chips. Jackson refused to call off his stack with pocket Fives early in the match with Kniep, getting his chips in the middle about 20 hands later with pocket Sevens and dodging the flush draw to win. Here's the final results from Event 1.